← Are There Any Spinners Out There? Posted on June 24, 2007	by Linda S.
Being a new convert to quilting, I found Sew A Quilt.com and decided that her quilt will be my next quilt….for any who doesn’t know…that means #2..grin The pic shows my first quilt which is a basic beginner’s quilt using the split rail fence. That one I know. The sampler quilt will use the rail fence, log cabin (with which I don’t foresee having any problem ), flying geese (with which I do foresee a problem), four patch, pinwheel and fair and square blocks. Gloria Massard had put together one of the most complete tutorials I have ever seen. She covers everything from how to choose your fabrics to sewing on the final binding. 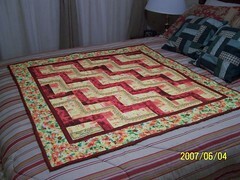 This entry was posted in Free Patterns, Handcraft, Handwork, Historical Textile, Needlework, Quilt. Bookmark the permalink. I browsed her block instructions, and you will learn several valuable speed piecing tricks that will propel you further into the land of quilting. The only thing I would add is this: Whenever she has you draw the diagonal cutting line and stitch 1/4″ from it to make the flying geese units, also sew a 1/4″ seam on the OTHER side before you trim along the drawn line. You will end up with slightly smaller half square triangle blocks that you can save and use for other projects…..